One of the questions I’m most frequently asked is, how do you find these locations? Sometimes I feel like the questioner is convinced that there’s a secret pro photographer society where we share prime photo locations (and scoff at outsiders), or perhaps I’ve inherited a comprehensive tome containing the coordinates of every photo-worthy scene on Earth. Uh…, not so much. The reality is far less interesting. First, it doesn’t hurt to have been born and raised in California—being within relatively easy driving distance of places Yosemite, the Eastern Sierra, and Death Valley gives me a lifetime of experience from which to draw. But as my workshop offerings expand, I find myself venturing into areas I don’t know nearly so well. Of course the people who spend good money to attend a workshop, not to mention their vacation time and travel expense, expect no less than expert location knowledge from their workshop leaders. Not only do they want to be taken to the “iconic” spots, they want to be shown special, less known, scenes. And they want to know they’re going to be at these locations at the best time. … lots of homework and very long days. On the other hand, the homework part I might be able to help with. It pretty much comes down to four things: Research, Inquire, Explore, Experience. But rather than elaborate in general terms, I’ll give you an example. I just returned last night from four days in Oregon and Washington, scouting the area in and around the Columbia River Gorge with Don Smith for a workshop we plan to add next spring. Don and I had both been there before, spending enough time to know that it’s ripe with possibility, but not so much that we we’re comfortable asking others to pay us money to show it to them. So we flew into Portland Sunday afternoon, rented a car and drove to Hood River, which would be our base of operations for the next few days. For many the research part of the scouting equation begins and ends with one or two sites the Internet. While the Internet is great, it’s not everything (and not always accurate). I usually start by scrutinizing topo maps to get a feel for the terrain, and road maps to better understand access and relative location (what’s near what). In this case, Don and I had done our map research before our earlier trips, but we definitely revisited the maps before returning this time. REI is a good place to start for topo maps, but sometimes you can find what you’re looking for online or in the vast selection of topo map apps available for tablets and smartphones. As much as I love my GPS for getting from here to there, for road research I prefer the old fashion, fold-out maps that I can spread out on a table. AAA is my go-to roadmap resource. Once I get a general idea of the lay of the land, I’m ready to drill down to specifics. Not only are books are more reliable and complete than the Internet, they’re also more portable. I try to find one or two books on my location—because most books include information that’s not pertinent to my objectives, I may not read them from cover-to-cover, but I do at least scan each page for info on the areas that might interest me. They also come with me, keep me company on the plane, and are rarely more than an arm’s length away for the duration of my visit. For my first Gorge trip I used “Day Hiking Columbia River Gorge,” by Craig Romano, which gave me lots of insights that carried over to this trip. Following this approach, Don and I had a real good idea of what to check out on this trip. We felt pretty good about our knowledge of the Gorge’s waterfalls (which we’d already explored—thanks, Leon), so this time we concentrated on non-waterfall opportunities, particularly views that would be good for sunrise and sunset. We came up with a framework itinerary that would allow us to cover all of the general areas and specific locations we’d identified. Some of the best spots (including Trout Lake, pictured above) we found as the direct result these, uh, inquiries (interrogations). In scenic areas like the Columbia River Gorge, most people are very proud of their home and enjoy sharing their knowledge. Not only were the local experts good resources for finding the best photo spots, they were able to steer us away from less exciting places we’d planned to visit, in one case saving us what would have been an afternoon-long wild goose chase. No matter how much research and inquiry I do, I never turn up everything. Some of my favorite spots have resulted from just checking out a road that looks interesting, or wandering down a trail to see whether the view opens up around the corner. This trip was no exception. For our first sunrise Don and I got up at 5:00 a.m. and just started driving up Highway 35 toward Mt. Hood and ended up finding a beautiful view of Mount Hood above the cascading Hood River. And on our drive back, rather than stay on the main highway, we detoured into the countryside and found some spectacular views of Mt. Hood above rolling farmland and blooming apple and pear orchards. It’s great to have knowledge of an area’s photo locations, but until you actually get out there and photograph your spots at the time you think they’ll be best, you’ll never know for sure (it’s one thing to make a wrong call on a spot when it’s just you, and something altogether different when you’re guiding a workshop group out to a spot at a time you’ve never photographed there). So after a long day of exploration, Don and I would decide what location would be best for the upcoming sunset and sunrise, then return. One of our inquiries at the hotel turned up Trout Lake as a nice view of Mt. Adams (Mt. Adams wasn’t even on our radar when we arrived because on our previous visits it was engulfed in clouds). We drove up there one afternoon, and even though Mt. Adams was again cloud-shrouded and completely invisible, we thought this would be a great sunrise spot if the mountain did come out. So the next morning, with clearing skies in the forecast, Don and I rose at 5:00 and drove up there in the dark. The color was just starting as we arrived (another reason we run locations ourselves first—now we know we need to leave earlier when we’re guiding our workshop group), but because we’d been there the day before, we were able to set up and start shooting just in time for the good stuff. The mountain was about 2/3 visible, its top third hidden by clouds that started pink soon became crimson, with the entire scene reflected in the exquisitely calm lake. The image here came a little before the sun crested the ridge to the south, when the sun was high enough to illuminate the herringbone clouds overhead without washing out the reflection in Trout Lake (which hung in there for the duration of our shoot, a real bonus). To bring out the reflection of the bright sky on the shaded lake surface, I used a 2-stop hard-transition Singh-Ray graduated neutral density filter. This made my reflection slightly brighter than my sky (defying the laws of physics), a problem I was able to fix pretty easily in Lightroom/Photoshop. We’re still not done exploring the Columbia River Gorge. Before next year’s workshop we’ll be making at least one more trip up there. Even though we feel extremely confident that we have more than enough to keep a workshop group busy and happy, it’s important to have options and backup locations. For example, on this trip the wildflowers were exploding (more on that later), and we spent a lot of our time checking out and photographing the prime wildflower spots. But wildflower blooms are notoriously unreliable—if next year’s trip misses the bloom, we’ll need to find other spots. And we’ll need to be able to handle whatever weather weather Mother Nature throws at us: rain, snow, sunshine—in spring it’s all possible. Will I mind doing more homework? What do you think? Don and I are just blown away by the photo possibilities up there. Not just in the Gorge, but all around there—we’re really looking forward to showing it to folks. I do believe you guys need a sherpa on these scouting adventures and I know the perfect old lady for the job. Thank you Gary for the great information. Very timely as Don Namm and I will be heading up the Oregon Coast in a couple of weeks to exercise our cameras. I too utilize the topo maps and have found the ones published in State Atlas’ by either DeLorme or Benchmark Maps very useful. They are up to date and show points of interest and clearly mark out Government land. Have a great trip, Gerry. Hi to Don for me. Great picture, Gary. Was there a 2 stop reverse ND grad at work there? 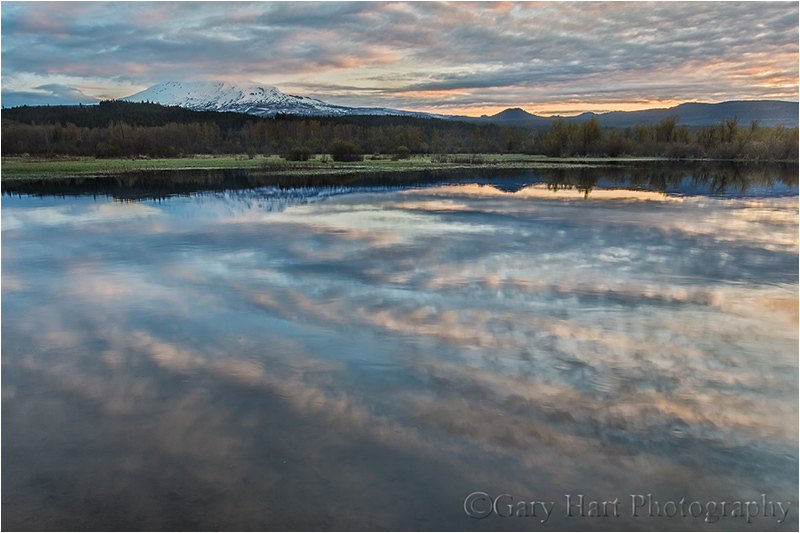 I’ll be up in the Columbia Gorge area the week of May12th in a small photo workshop group. Looking forward to it.. I didn’t get my Oregon fix last year, so this year I’m making up for it — Columbia Gorge, & Silver Creek Falls state park this trip and the next trip will be Crater Lake NP. I am looking forward to the announcement of your new Oregon/Washington worksop. I love your image – and it reminds me how often you discuss the strategy of “working the image”. I know you and Don were standing in the same location at Trout Lake, yet your two images of this site are both so beautifully different.